Patin Gret Leistung loves Regelinda as if the long, golden-haired child were her own. When Regelinda escapes to find her birth parents, she is locked in a tower for her efforts. Gret’s magic is dulled, having been cursed by another witch years ago. As such, she seeks out the assistance of a powerful witch, Heinrich, and a strong human, Gunther. Only together can they hope to recover Regelinda. The hour grows late, and the parents have gained magic of their own. Will the love of a patin and her teenage daughter be enough to overcome their obstacles? 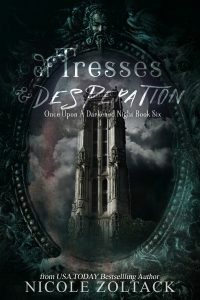 Of Tresses and Desperation also includes the short story The Cost of Greed.